I’m counting things. Two miles from Pete Lake from the shortcut. (How many times up this trail already this season? I have stopped counting. Would rather go anywhere else.) Thirty minutes for lunch. Eight Boy Scouts. One bag filled with Canada thistle flowers–a noxious weed that should not be allowed to go to seed in the wilderness. Seven stakes pounded into excess social trails with little signs requesting that people not walk or camp there. Four firepits cleaned, one destroyed. Two piles of human feces buried. One pound of litter picked up. Two miles back out to the truck. The Pete Lake area is pounded. Loved to smithereens. It’s a short easy hike, popular with beginning backpackers, families, and others who are not ready for longer steeper trails. 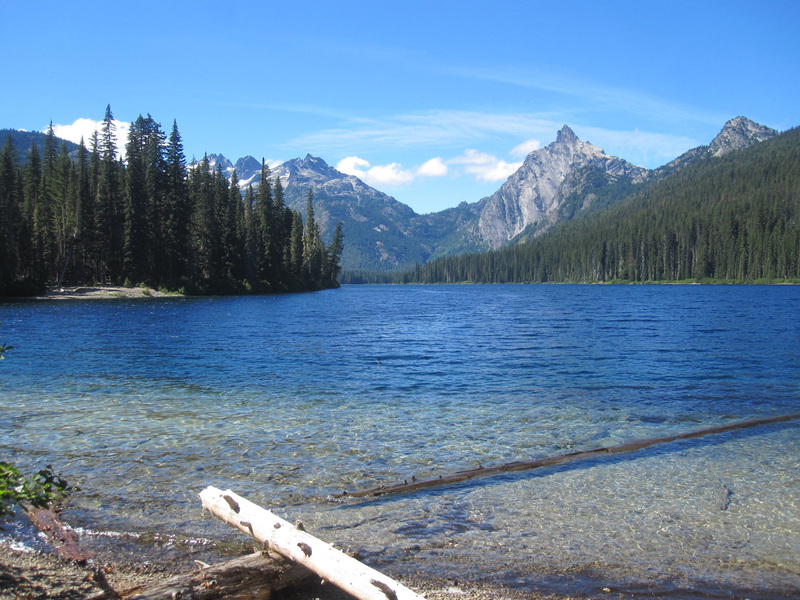 Thanks to guidebooks and internet hiking sites, Pete Lake is more well-known and popular than ever. It’s not such a long drive from the city, and most of the road is paved. I realize it’s not going to get better. So many people go there, and why not? It’s public land. The task of teaching people to care for the places they visit feels impossible. Care = watchful regard or attention; heed. Attention to where one puts one’s feet, to what one removes from the backpack, to what falls on the ground, to what goes in and out of one’s body. Attention to fire, water, earth, air, living beings. Attention to one’s passage through the world. Pete Lake is a sacrifice area, a place not too far into the wilderness. Let the masses go there, so that the deeper wilderness can stay primitive and untouched. To protect places like Pete Lake would mean restricting access by letting only a few in. Politically, that idea is dead on arrival. The only way it could happen would be to allow the bridges over the rivers to decay so that people couldn’t drive to the trailhead. Or implement a strictly controlled permit system. It disturbs me deeply that we created wilderness areas but can’t keep them wild. I hike back with a dark cloud over my head, trying to reconcile reality with ideals. Curmudgeonly misanthropy arises in me. I want reverence. I want people to crawl here on their hands and knees and be humbled. Better yet, I want them to stay home. As I grumble to myself, I hear something flopping around in the brush. My eye catches movement, and I drop to my knees. 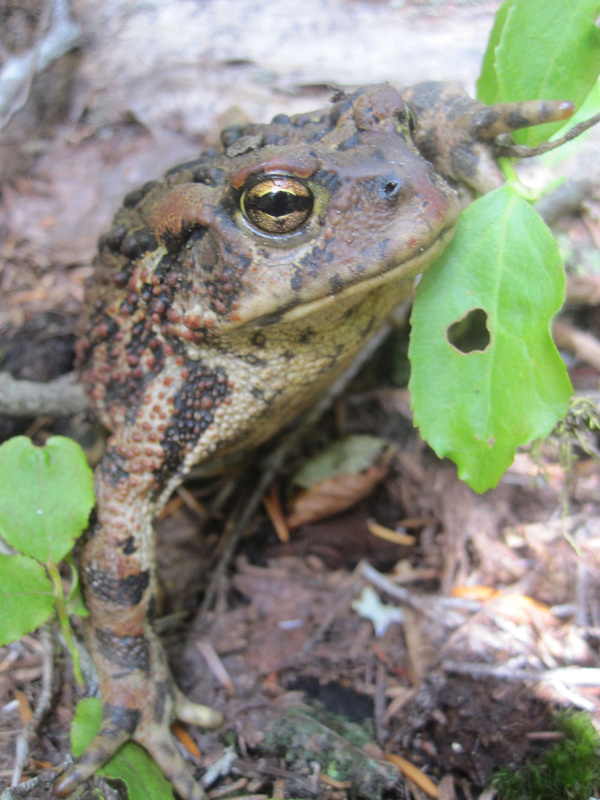 Bufo boreas, the western toad! My attention is captured by its thick body and loose lumpy skin. The cinnamon flecks of color, the thin yellow stripe down its spine. The eyes are liquid gold. Long toes splay across leaves. The ivory throat pulsates, and I see the nostrils dilate. The toad breathes, just as I breathe. For a moment, we breathe together. My sense of wonder rekindles, and reverence arises. One toad, and my perspective is restored. The pack is packed for three days. Nine miles to Waptus Lake, and my earworm is a line from a Neil Young song: “Old ways…are a ball and chain.” The trail is dusty, and I shovel loose rocks out of the tread as I walk along. After years of practice, I can do this without breaking stride. Clang, fling, thump. The river is lower, the water sound muffled. The vine maple is vigorous, poking into the trail a little more aggressively than a month ago. A few huckleberries are ripe, and I sample freely as I pass. There are very few mosquitoes and flies. Butterflies everywhere, especially the ones that gather on horse dung dropped in the trail. They have ragged-edged wings and orange spots, fluttering up in a bunch as I approach. 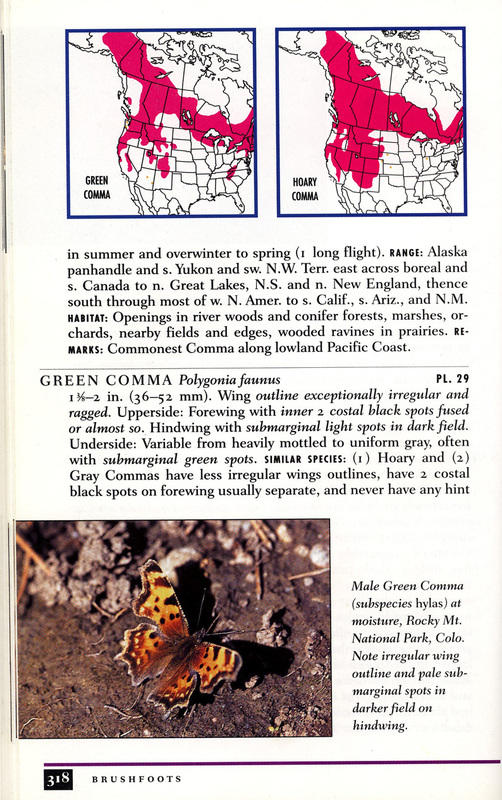 The book says that green commas (Polygonia faunus) emerge in mid to late summer, overwinter, and reproduce in the spring. They favor boreal and mountainous areas in western North America, often along or near streams. So the subalpine firs, Engelmann spruce and Douglas-firs along the Waptus River are perfect for them. I smell smoke on the descent from Cone Mountain, and wonder what I will find. I suspect an abandoned campfire, which is exactly what I find. It smolders only a few feet from the river and I wonder that the campers did not think to dip their cooking pot in the water and dump some on the hot ashes. A half-melted beer can appears as I stir the fire, and I am not surprised. These people were thinking of other things. After the fire is out, I pick out the trash. “Dumbshits,” I think to myself. Sigh. I never catch them. I only meet nice people. The sound of a loud airplane wakes me from a dream. I crawl out of the tent. The air is cool enough that I want my down jacket and a warm hat, but only until the sun comes over the hill. By then I have had a cup of green tea, a bowl of oatmeal with fruit, and scribbled in my field journal. Pigtails are renewed for the day, sunscreen applied, and I’ve checked in by radio. I’ll be patrolling the Waptus Lake campsites today. I cross the river and head to Quick Creek. It drops steeply from Waptus Pass and dumps into the lake across an apron of gravel that has washed down. There are a few campsites here. I am pleasantly surprised to find no piles of poop, and not much trash. But the fire rings are in need of attention. Rocks have been piled high to contain mounds of ash and charcoal. 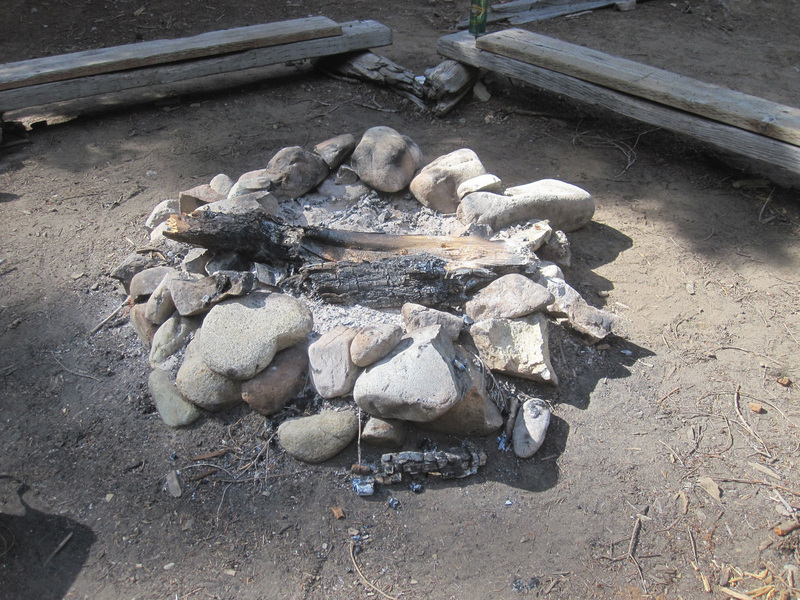 These fire rings need to be reduced in order to encourage campers to build smaller fires. I hurl rocks into the brush and throw a few into the lake just to hear the splashes. I have a special sack for carrying ashes, and fill it again and again. Ashes are dispersed into thickets–out of sight, out of mind. It takes all morning to reduce three fire rings to modest size. It is hot in the sun, and I find a shady place to eat my lunch before crossing the river to do more campsite work at the lake. One of the elements of Leave No Trace camping is “Minimize Campfire Effects”. The idea is to keep fires small, use small fuel such as twigs, and burn everything to ash. Also to avoid stripping fragile areas of wood and leaving sooty black marks on rocks. And of course, there is always fire danger especially when the weather has been hot and dry. The fire issue is a frequent topic of conversation when I meet people. I ask if they really need that fire. If they choose to have one, I encourage them keep it small, and put it out with water. It’s best to use an established fire ring. I destroy any new ones I find, and am amazed to find them built on top of rotten wood and other organic material. The other thing I find is small trees that have been hacked down for firewood, leaving unsightly tall stumps. Apparently many people carry hatchets and feel obliged to use them. I don’t have time to remedy this, so the ugly stumps stay. When I return to camp in the evening, it’s still warm enough to wash up in the creek. My skin is blackened from the fine ash that has penetrated my clothing, almost as if I have been fighting fire all day. I do not build a fire in my camp but watch the moon rise over Polallie Ridge while nighthawks buzz and wheel overhead. The weather changes. Marine air pours over the crest, wrapping Summit Chief and Bear’s Breast in woolly gray clouds. Wind rushes down the valley, ruffling the surface of the lake into waves and whitecaps. 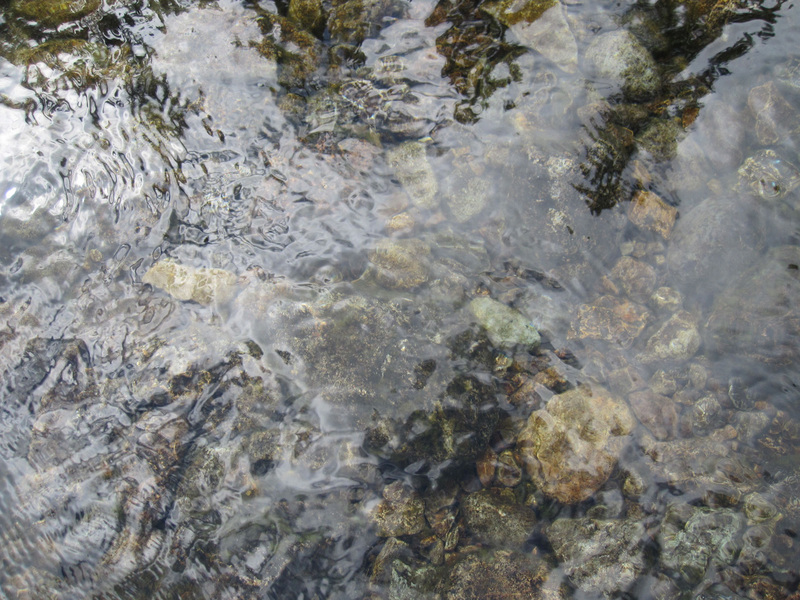 I wade the river one last time, letting cool water lap my calves and bathe my feet. The rocks are golden and speckled with dark algae. Without the glare of bright sun, the spires of trees reflect softly. I’m hiking out with an empty food bag and several pounds of garbage. The ubiquitous burned foil. Broken glass. A pair of broken sandals, abandoned underwear, shreds of duct tape, cigarette butts, an empty plastic bottle that held some sort of liquid to mask a hunter’s scent, as well as a few wrappings from my own food. The weight on my back is familiar. I’ve been backpacking for several weeks now, and am feeling strong. The miles pass under my feet. My senses register changes in wind, a ribbon of flower scent, a few drops of moisture. My mind has stilled. The earworms have lost their potency; the worries I carried in with me have shrivelled. I just walk on this trail, moving toward the next moment. This time the transition is smooth. I return to the ranger station, deposit trash in the dumpster, debrief, write up some notes. Carry my pack home. Here is my garden. Here is my cat. Here is some supper, a shower, bed. It feels just right. Its a tough one – like watching people “camp” in their immense travel trailers (larger than our houses), with dish reception, generators and all their electronic toys. We are “loving” places to death. Wonderful photos. I feel like I was there. I learned from this too. Such important work that you do, thank you! I understand your frustration and ideal of sacrificial wilderness, unfortunately a lot of people just don’t get the leave no trace motto. They should make it a requirement to go through a short leave no trace class before getting there forest pass. When I was last up at Pete lake the place was packed. I couldn’t find a campsite and ended up camping in an enlarged part of the trail. spectacle lake was not much better. There were at least 30 people camped there.The ethics of camping there were a little closer to the LNT motto, but i was still able to pack quite a bit of garbage out of there. and it is a wonderful blessing of nature to be able to snap us out of a funk and bewilder our imagination with the simplicity of a butterfly. Stay safe and enjoy yourself. I so look forward to bumping into you on the trail someday. Hi Deb, I have a question for you about maps. I don’t see another way of messaging you other than through the comment section. So sorry about being partially off topic. As I hike through different trails and wilderness I like to know some of the history of the area. Fire, Mining, battles over wilderness. I also like to know how and why a landmark, Mtn, creek/river, pass, lake/pond, meadow got its name. I have learned a lot by reading other peoples blogs when I research an area, but this is second hand info that is incomplete or sometime contradicting/wrong. do you know of a source that would cover these types of information.